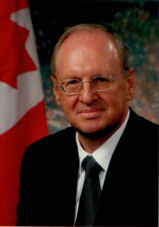 Gaëtan Lavertu has played a prominent role in Canadian diplomacy, holding positions at all levels of the Department of Foreign Affairs and International Trade, notably as Director General of Foreign Intelligence, Assistant Deputy Minister for Political Affairs and International Security, Associate Deputy Minister and finally as Deputy Minister. He served at 10 posts abroad, several with the rank of Ambassador, primarily in Europe and Latin America, until his retirement from the Foreign Service in 2008. He holds master’s degrees in international relations, business administration and public administration.